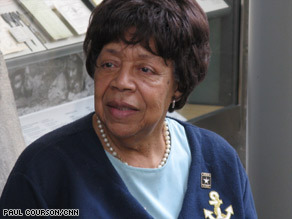 ARLINGTON, Virginia (CNN) -- The honors were late but still well-received Wednesday for members of the first all-African-American, all-female unit to serve overseas in World War II. Mary Crawford Ragland said when they came home from service, there were no parades for them. During the war, nearly 1,000 women from the "Six-Triple Eight" Central Postal Battalion moved mountains of mail for millions of American service members and civilians that clogged warehouses in England and France. "There was no parade," said Mary Crawford Ragland. "We just came home." The group also gives a letter of appreciation signed by the Army Chief of Staff and the Secretary of the Army, an Army lapel pin and an Army decal. For Alyce Dixon, 101, it was worth the wait. "They asked me because I'm one of the oldest survivors, and I can still talk," she said with a smile. Nearly 800 women that were part of the 6888th were first stationed in Birmingham, England, for three months, moved to Rouen, France, and finally settled in Paris, according to the Army's Web site. Watch an encore of the CNN documentary that provoked dialogue across the nation. They were responsible for redirecting mail to more than seven million people -- all U.S. armed forces in the European Theater of Operations, including Army, Navy, Marine Corps, civilians and Red Cross workers. Soldiers continued to move, fighting battles across the continent, but weren't getting their mail. Morale began to drop. That's when the Army turned to the "Six-Triple-Eight"
When Dixon and the other women arrived at a warehouse in early 1945, they found the building had no heat. "They had 90 billion pieces of mail," Dixon told CNN, some of it from hometown friends and family addressed only to "Junior, U.S. Army or Buster, U.S. Army," she said. "We had to figure it out," she said. Even when there were complete names, it wasn't easy. On Wednesday, the favor was finally returned.